Monaco was great fun despite being a bit off the pace in qualifying and a decision not to start the race due to wet conditions. 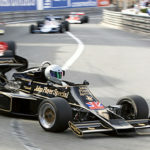 It was to be a busy week with Monaco the first weekend, back to United States for a business meeting, then back to England for the Lotus 77 to be featured in Rush, a movie about James Hunt and Niki Lauda that is being made by Ron Howard. I arrived in Monaco on the afternoon of May 9 and joined friends for dinner at Les Deux Freres, a wonderful restaurant high in the hills overlooking Monaco. The next day was scrutineering and registration, followed on Friday by qualifying for some of the other race groups while our group’s two qualifying sessions were set for Saturday. Some of the race groups had more entries than would be allowed to race – including ours, with 43 cars entered and a limit of 35 for the race. Even at 35 cars, that’s quite a bit of 3.0 liter F1 traffic for a tight circuit like Monaco. Qualifying went well, however, and the number of cars on track did not seem to present a problem. I wound up about halfway down the grid with a time of 1:43, about 3-4 seconds off my best lap time at Monaco in years’ past. The weather was good the entire weekend until about 20 minutes before our race – the last race of the weekend at 5:50 p.m. on Sunday – when the heavens opened up. I opted not to race, given the wet conditions, the absence of any room for error at Monaco, and the upcoming filming. 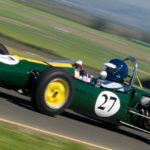 Those who did go out drove well, although there were a number of spins and at least six cars sustained damage due to contact with barriers or other cars. I had no regrets about my decision. Other Americans did well, with Duncan Dayton winning the pre-1973 3.0 liter race in very dramatic style and claiming his 11th overall Monaco victory, and Mike Fitzgerald and John Delane finishing 2nd and 4th respectively, in that race group. Arriving at Heathrow at 6:15 on the morning of May 17 following a quick trip back to the States after Monaco, I drove directly to the Rush movie set at Blackbushe Airport, about 40 minutes away. Filming was scheduled to start at 8:00 and continue for two days, with the set modified along the way to recreate the front straight, grandstands and pits at different circuits including Nurburgring, Brazil, Monza and Fuji. 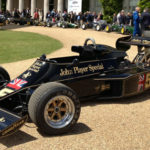 More than a dozen authentic F1 cars from the 1976 season took part, plus several replica F1 cars that could be fitted with cameras and various replica bodywork. My friend Nick and I were introduced to Ron Howard, who expressed his appreciation for the use of the historic cars and his interest in making the film credible for F1 enthusiasts as well as entertaining for the general public. I was impressed with his modest demeanor and his directing skills, and his decision to film actual standing starts, passes and pit stops by the historic cars (as opposed to relying more on computer graphic effects). In fact, we were told that historical footage would be used for the backgrounds, digitally added to the new footage that we were creating. I was also impressed with the diligence of the directors, actors and the entire crew: Filming went from 8:00 a.m. to 8:00 p.m. both days. We began by reenacting standing starts and pit stops at the set recreating Nurburgring, where Niki Lauda had his near fatal accident in 1976. The reenactment included some orchestrated theatrics: Andretti comes in for a tire change only to find teammate Gunnar Nilsson still in the Lotus pit, so he must pull in diagonally behind him, blocking the pit lane. Andretti waves his arms for the Lotus crew to finish with Nilsson so he can pull in to the Lotus pit. Meanwhile, Lauda has completed a tire change and is trying to drive down the pit lane but is blocked by Andretti, begins waving his arms in frustration, and loses several seconds due to the delay in the pit lane. The next scene was the Italian Grand Prix at Monza. Unfortunately, 77/3 decided to develop a fuel leak at that point, so I was retired from the Monza grid for repairs. 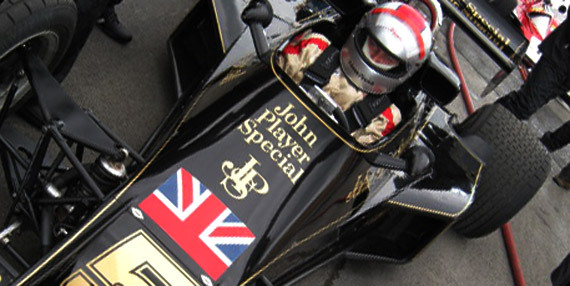 Reenactment of the Japanese Grand Prix at Fuji was next, with a significant role for Andretti and Lotus since they took both the pole and the win there in 1976. The pressure was on in dramatic fashion akin to real racing! 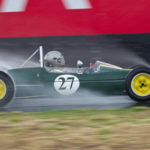 Thanks to the extraordinary efforts of Lewis Cullington of Classic Team Lotus, the cause of the leak was diagnosed, an obscure O-ring was sourced and fitted, and we were on the grid for Fuji with about 30 minutes to spare. For me, the reenactment of the Japanese Grand Prix was the high point of the filming. The Japanese Grand Prix was the last race of the season in 1976 and would decide the World Championship. 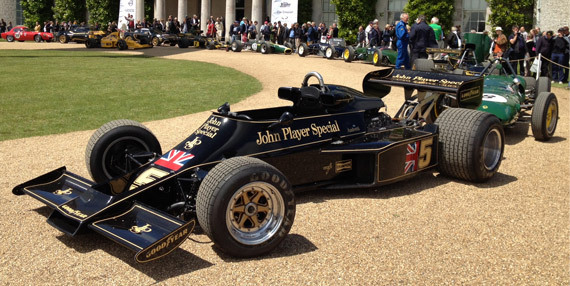 The Andretti Lotus was on the front row beside James Hunt’s McLaren, Lauda was to start on the second row, and heavy rain delayed the start of the race – and it was still raining heavily when the race finally started. In fact, conditions were so poor that Lauda dropped out of the race, forfeiting the World Championship to Hunt who was second in the points. 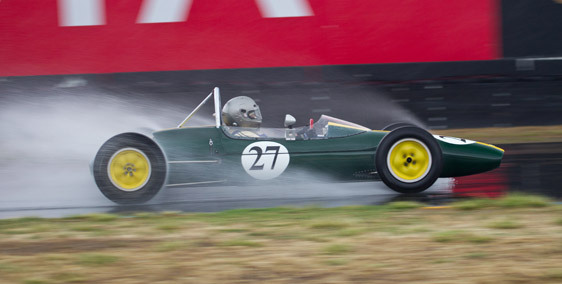 The severe weather conditions at Fuji were recreated for the film with an array of nozzles fitted to a crane high above the grid, drenching the cars and drivers with heavy rain during filming of the grid, standing starts and numerous passing maneuvers along the front straight. In between takes for the standing start, Ron Howard walked over to where I was sitting in my car on the grid. He leaned down and said “You’ve got a really cool car. 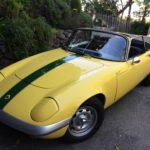 It’s my favorite – and I think you’re going to win this race.” In fact, Andretti describes the win at the Japanese Grand Prix as one of his greatest achievements, driving the entire distance on one set of tires and taking the victory – his first for Team Lotus. And, of course, it was the first of many Andretti victories for Team Lotus, culminating in the World Championship two years later. All in all, an amazing experience. 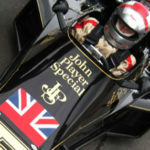 Rush is due out next March and, based on my impressions, will be a great film. Ron Howard clearly has the talent and the track record, and the authenticity he is bringing to the film is very impressive.